Should workers worry about automation and AI? Many workers, policy makers, and researchers are asking themselves exactly this question. But the answer has proven elusive using traditional tools and methods. While some fear the end of employment and rising wealth inequality, others celebrate rising productivity and new frontiers for innovation and investment. The confusion between these perspectives arises from several barriers that inhibit today's study of AI, technology, and the future of work. Ballet is an artisanal good that typically requires a highly skilled dancer, but new technology may enable the production of this good using only unskilled dancers. Does this mean pay for ballerinas will go down? Does this mean employment for unskilled dancers will go up? Why can competing perspectives coexist? Fulfilling skill requirements is essential when workers apply for employment. Therefore, overlapping skill requirements may approximate potential career transitions between occupations. This insight is possible with granular skill classifications that capture real-time labor demands. We need to improve the granularity with which we study specific workplace tasks and skills and their interaction with specific technology. Although a given technology performs specific tasks (e.g., a robotic arm performs a fixed motion and a machine learning algorithm solves a specific mathematical optimization), labor is often studied through coarse descriptions that enable equilibrium analysis (e.g., non-routine cognitive versus routine physical work). However, persistent technological change implies that labor is never truly stable. Understanding the microscopic perturbations of technology on the demand for different skills will improve our understanding of the macroscopic labor trends discussed today. We need economically resilient workforces that are adaptable to changing labor demands from new technology. The labor implications of past, present, and future technology can differ drastically, and persistent technological change implies that labor will be constantly in flux. Therefore, instead of simply promoting the skills du jour, we should instead promote economic resilience. This goal requires refined insights into granular skills beyond the coarse labor categories which only enable equilibrium analysis. The features of wealth inequality and job polarization are spatially embedded. Future of work studies focus on national employment trends, but the skills that differentiate high-wage and low-wage work also distinguish between different labor markets. This means nationwide wealth inequality and job polarization are spatially embedded into workforces. Accordingly, the mechanisms that promote today's cross-sectional employment trends may offer insights for policy makers seeking to maximize productivity gains while minimizing the loss of employment opportunities within their community. Further, since employment opportunities are the leading factors in workers' decisions to relocate to cities, understanding the complementarities between the skill sets of different areas could improve models of spatial mobility, economic activity between regional economies, and urbanization. Improved study of workplace tasks and skills, and the technologies that perform them, enables new frameworks for forecasting the future of work. Overcoming these barriers enables new forecasting techniques for the future of work. If we model granular workplace tasks and skills, then the skill requirements of online job postings could promote real-time forecasting of labor trends. Assessing the skills and tasks that a technology can perform enables us to consider patent filings as a glimpse into the technologies and resulting labor trends of the future. 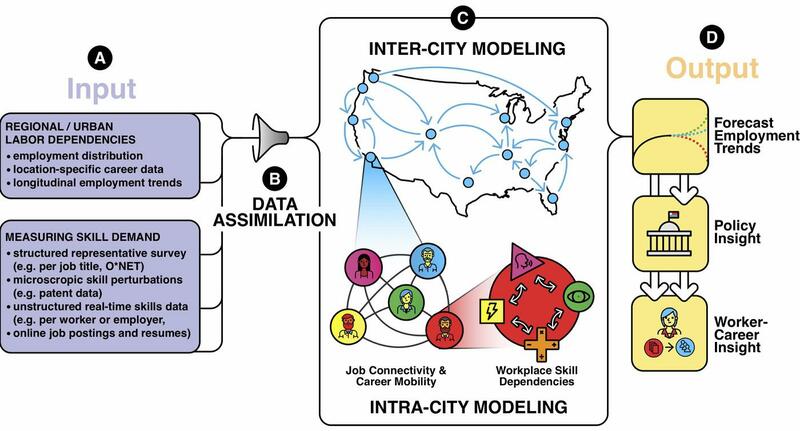 Further analysis of economic resilience and the dependencies between labor markets will enable new modeling of both inter-city and intra-city labor trends with technological change. Finally, improved forecasts of the future of work have the potential to dramatically improve public policy and insights for workers seeking to advance their careers.